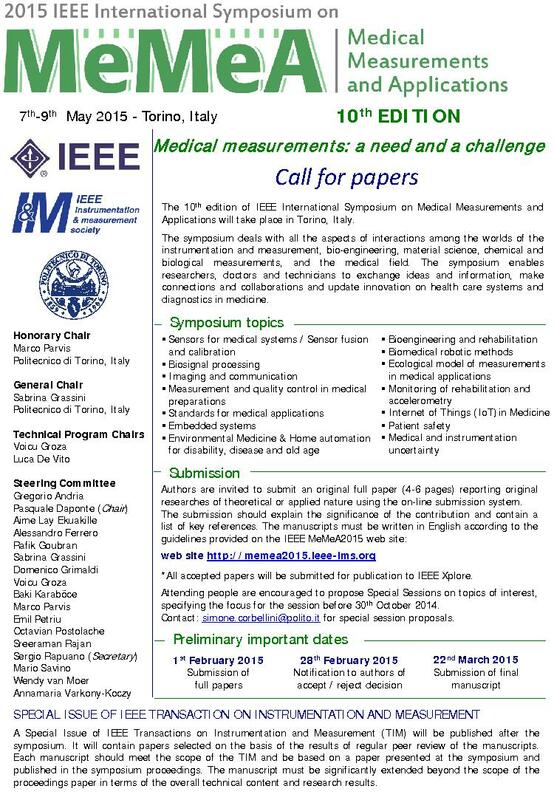 People with specific diet requirements are kindly invited to inform the organizers by sending an e-mail to Chair@Memea2015.polito.it . We will try to take care of all the requests. The welcome party will be held on Thursday, May 7th, in the Sala delle Colonne and in the courtyard of the Castello del Valentino. A buffet with traditional and regional cuisine will be offered to all MeMeA2015 attendees (www.maurocatering.it). During the party a musical entertainment will be organized with the participation of the chorale of Politenico di Torino, directed by Giorgio Guiot and Dario Ribechi. This site is created, maintained, and managed by Conference Catalysts, LLC. Please feel free to contact us for any assistance.